My parents are in the process of possibly picking out new tile for the bathrooms in their house. Of course I have to give my two cents, so here are a few pretty inspiration pics of ideas I had in my head. I know my parents don't love lots and lots of white, so the above bathroom has nice color added in with all the pretty tile. I don't really love the sinks here, but I do love the tile and how it goes most of the way up the wall. This could get really expensive, so doing a half wall would be more economical. Round tiles would be fun in the kids bathroom for the floor. 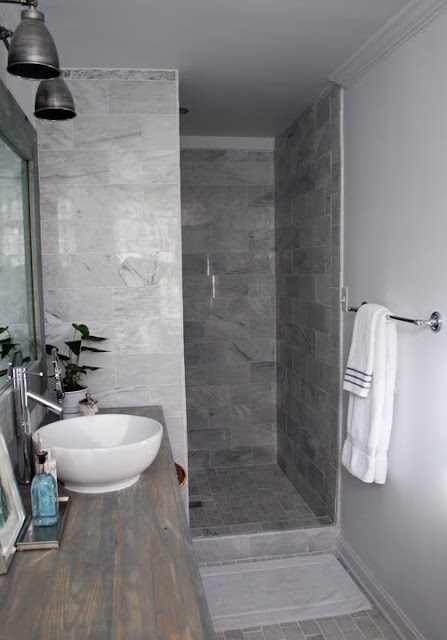 I love the marble subway tiles here too, but to save money I might nix the tiles on the wall and use plain white subway tiles in the shower/bath area. 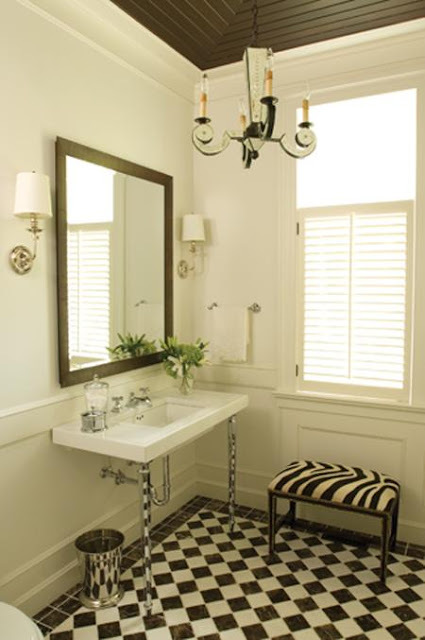 I also like the look of the sink area here, the legs give it that furniture look which is pretty. I'm sure my parents are going to nix this idea right away, but I just love the checker board pattern. 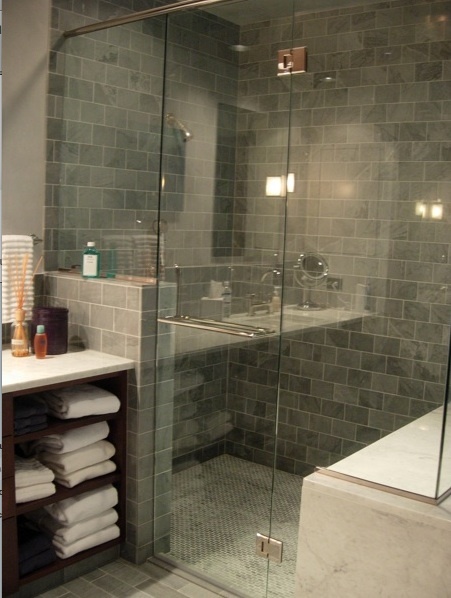 A little change from all the white above- I love the gray color here and the size of the tiles. 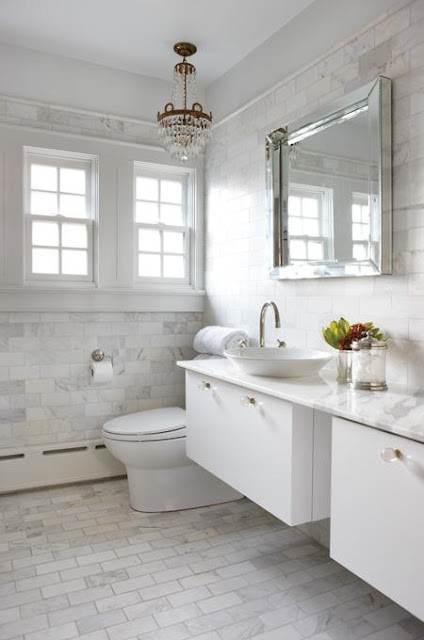 More plain white subway tile and marble together- would look good with a dark wood vanity as well. 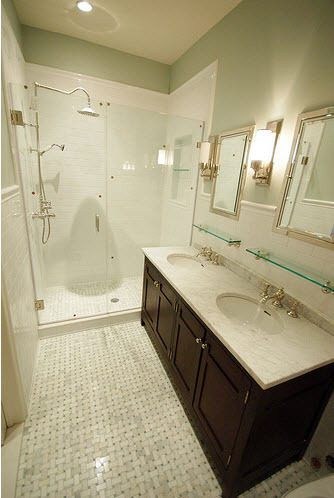 Here is another bathroom in her house- love the basket-weave floor and the shower door- such a clean crisp look here. OK, so I guess I really have a white/gray marble thing...don't hate me. Photos from:Coastal Living, House and Home photo by James Tse, House and Home photo by Janis Nicolay, House and Home photo by Angus McRitchie, House Beautiful, Melanie Elston, Southern Exposure Blog, Sunset Magazine, Traditional Home design by Missy Connolly, Decorpad, and the last two photos are the bathrooms in A Brooklyn Limestone in Progress's home. 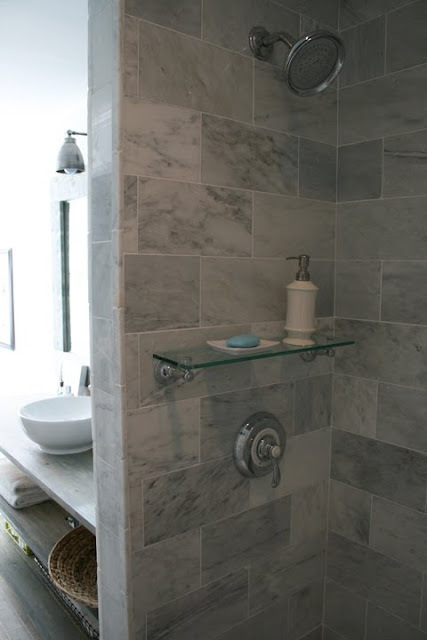 We did our baths, used marble for the floor, love it today as much as 8 years ago, all white fixtures and white tile- easy on the eyes. I'm not typically a glass door gal...but that 11th photo is AMAZING! Some great images but my favorite is the one with the dark wood floor. I am working on my kitchen and am finding all of the tile options a bit overwhelming! Love this tile as well. I especially love the blue-ish tinted tile. 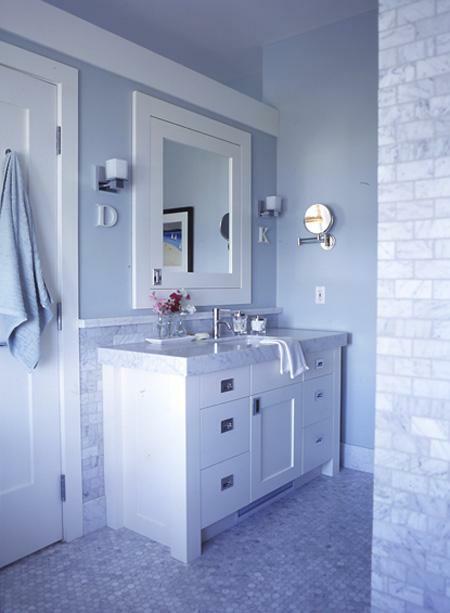 I love all of the marble tile! I vote for the basket weave on the floor in the last bathroom. It is so timeless. It will be beautiful for years to come. 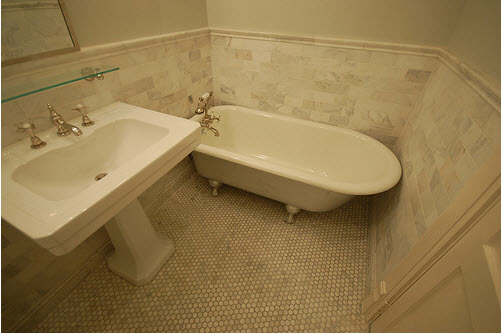 Those are ALL drool-worthy, but I think I have a soft spot for Mrs. Limestone's - the basketweave floor is to DIE for! Oooo me too! Me too! These are absolutely gorgeous! love them all! these are great for inspiration! I just helped my parents renovate their bathroom and have to get some good after shots to post. so fun! um, are you watching The Bachelor right now? this is ridiculous! I am obsessed with Carrera marble, I love it! I have a grey/white Carrera marble thing, too! I am all over this one!!! Be sure to tell us what your parents decide! I am completely in love with the top photo. The artwork displayed in a line at the top is fabulous!! such a pretty post. I hope one day to have marble too, sigh. oooo, i love them all! So pretty....sigh....ok you know, I have to say i'm a crisp white bath kind of girl but the cream is so soft and looks so established like it's been beautifully that way forever. I too love Limestone's renovation! Have added LEB to my new list of "beautiful blogs" to keep up with more regularly. 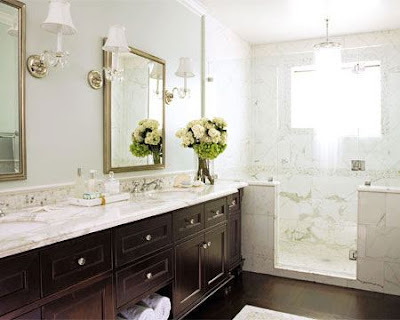 I do want a white marble bathroom one day- but no white marble on the floors (I have dark brown hair)! oh my goodness you have some fantastic examples here!! These are all gorgeous! 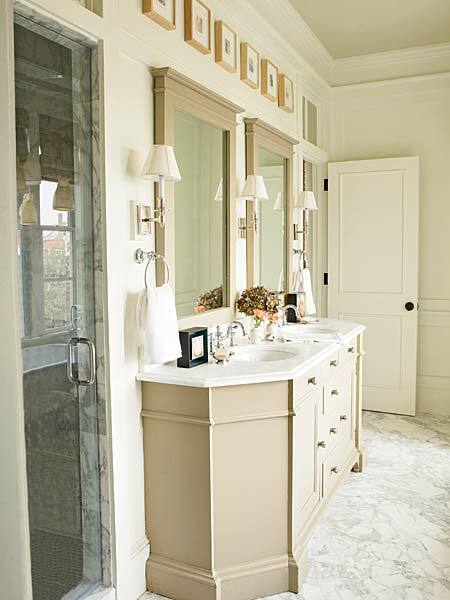 I love the little chandelier in the 2nd one, and of course Brooklyn Limestone's bathrooms - that woman has major style! Yum. Bathroom goodness . . . I think we have very similar tastes! I am finally at the point of redoing our master bath and my requirements are a lot of white marble oversized 'bricks' - an exaggerated subway tile look - and a bit of either dark brown or warm gray marble, plus a tiny bit of light blue. If that turns out to be too much $, we're going with good 'ol subway tile, plus a marble countertop. Regardless, your photos are very helpful for me re. layout, etc! Thank you!